Livadia is the capital city of Viotias. It is the economic and trading centre of the area, and was built on the left hand side of the dried lake of Copaida. 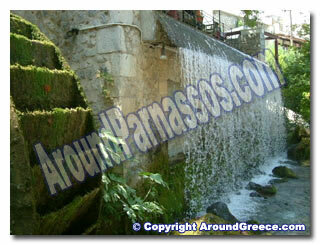 The river Erkinas passes through Livadia. On the north side of the city you can see Parnassos and Elikonas. At the foot of the Elikona hill is where the old city of Livadia was built. The municipality includes Lafistio, Romeiko, Pera Horia, Jimeika, Amalipli and Tsoukalades Elikonas. Livadia is located right at the centre of Greece and has direct access with the other big cities in Greece, such as Lamia, Amfissa, Karpenisi, Halkis and Athens. The main economical sources for Livadia are the preparation of raw cotton, light manufacturers, handicrafts, and trading and services. The agricultural production also contributes to the cities economy with in smaller amounts, and was not very productive, in a financial sense. 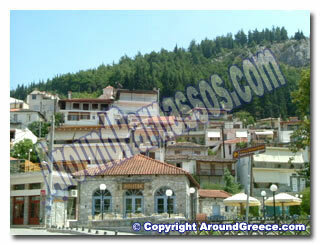 Livadia is surrounded by archaeological places, such as Heronia, Orhomenos, Thiva and, of course, Delphi. In Livadia, there is also one of the four Catalan castles, and the Trofonion oracle, which was one of the most important five oracles in the ancient years. Traditional ways of life and scenery give this city an extraordinary beauty and colour. The area of Kria, which is also the name of the streams that flow from the river Erkina, is located at the south side of Livadia. The area is very unique and extremely beautiful, and is full of archaeological monuments and findings, showing the legacy of history and architecture in the area. There are also culture and recreational centres in the area as well. There is a medieval castle, the Thofonion Oracle, rebuilt traditional factories, open theatres, trading and exhibition centres, the historical and archaeological museum, and stone bridges which are centuries old. The clock tower was built during the French occupation, and was originally used as a lighthouse. In 1803, the tower was rebuilt as a clock tower, and the clock was actually donated by Lord Elwin. This donation was given so that he would be allowed permission to start his archaeological digging. The two large centre squares connect with the pedestrian road, and the meeting point of people who live in this area. On the mountain of Elikon, there are many paths, which offer beautiful walks, with fantastic views on offer. There is the traditional small village of Zeriki. Here you will find a picturesque plateau, which during the winter season, turns into a lake. The village was deserted during the last 40 years or so, but today remains a tourist attraction for many visitors. In Livadia, as well as all over Greece, Easter is the most famous and celebrated festival of the year. People from all over Greece come to Livadia to celebrate the big festival of Christianity. Easter is Livadia is a tradition that started many centuries ago. All generations of people take part in the celebration. The custom of "Laks" (hole on the ground) takes place on Easter Sunday. From early in the morning, holes in the ground are burning with leaves and vine branches, so that later in the day the people will start to barbeque the lamb. Livadia will be covered with a layer of smoke from all of the barbeques, and will also have a delicious aroma to it. Everywhere, you will find people singing and dancing to traditional music. Wine, eggs painted red, and food are offered to any and everyone how will stop for a bite or drink. This tradition lasts well into the night, where there will then be a huge festive celebration at the main square. Here, you will again find traditional music and dancing taking place, as everybody joins in with the celebrations. The night will finish with a beautiful firework display. This is a tradition that had been taking place until the end of the Second World War. During the last few years, this tradition has started taking place again, and is on the last Sunday of the Greek Halloween. This follows the traditional preparation of the maypole, in which every neighbourhood has it's own maypole, and large parties with people dressed in fancy dress, known as "Maskarata". At these parties, you will find traditional music and dance, and free wine lasting all night long, are the characteristics of this special day. In the main square, all of the maypoles are gathered, and the "Maskarates" take place, with pantomime and comedy sketches. This is a cultural festival that takes place on the open stoned theatre of Krias. This festival lasts for 20 days, and is a yearly traditional that takes place every September. 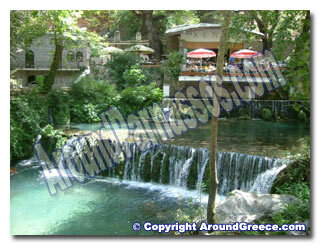 The theatre, which is situated in a gorge, and holds approximately 1500 seats, is surrounded by natural beauty. The acoustics here are perfect, so this theatre is the ideal place for such shows and festivals like this one.